Today’s guest is one of my classmates from college, Michael Ann from michael ann made! We used to sit next to each other in sewing class. It was so funny to get a comment from her saying “Hey, I think I know you!” Made my day to reconnect with old buddies online. Michael Ann’s has a fun crafty blog full of ombre dip dyes, collections of pretty things,and lots of restyles! where i love to share projects and tutorials on sewing, refashioning, and making cute things! but didn’t find each other in blog land until recently! 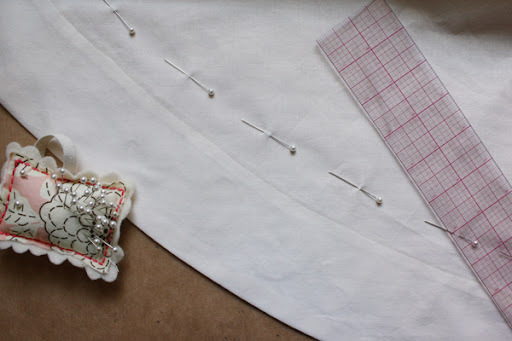 and thought it would be fun to share a tutorial on using horizontal pleats to shorten or lengthen a skirt. and a little grouping of tiny knife pleats along the hem of a skirt can add a lot to a plain skirt. 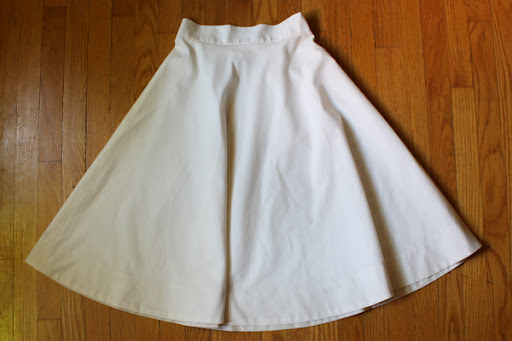 if your skirt is too long, you can add more pleats to use up more fabric and raise the hem. and add a panel of pleated fabric, maybe in a contrasting color to add extra spice! but the hem hit my calves at a silly spot and it was just a little too plain. perfect formula for a refashion! 1 – as with all pleating projects, you need to start with a little math. and will be sewing what will become the depth of each pleat. i knew i wanted pleats that were a small width, with a little bit of fabric in between each pleat. i decided on 3/8″ pleats with a 1/4″ space between them. 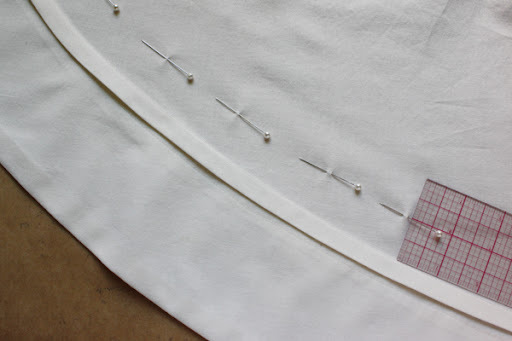 so i marked with pins 1″ from where the stitching of my hem was all the way around the skirt. 2 – now for ironing! fold along the line that you just marked with the pins, ironing in a good crease. then just pin along your fold to keep it together nice and pretty. 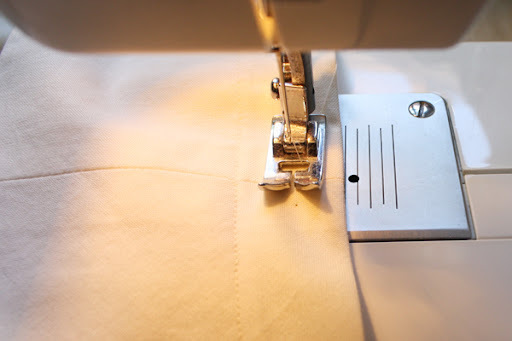 3 – when you have your fold all ironed take it to your sewing machine. 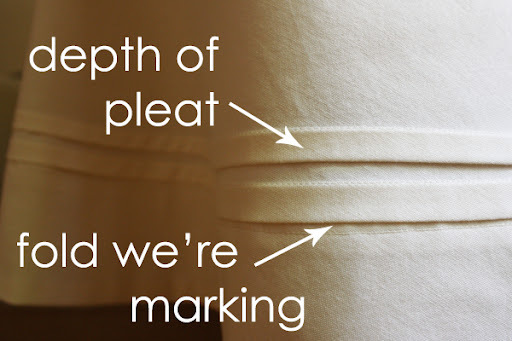 line up the fold with the guide on your machine to be the pleat depth you decided. so i sewed with my fold hitting the 3/8″ mark on my machine. now you have a pleat! 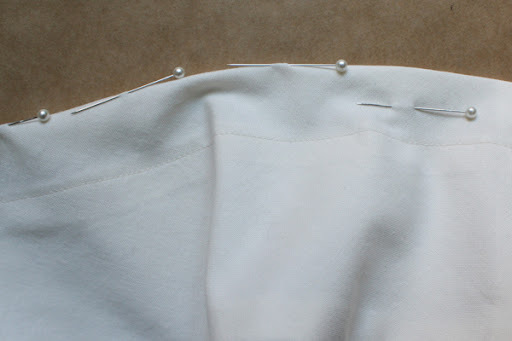 4 – iron the pleat you just finished really well so that the pleat folds down towards the hem. now measuring from the previous pleat’s stitching line. but you could do as many rows as you like! I’m SO going to do this one. I LOVE this skirt. So simple and pretty!